Choreographed by Dyana Sonik-Henderson, the performance features four dancers, Sonik-Henderson included, who channel the spirits of The Phantom of the Opera, Laughing Man, Frankenstein, Dracula, The Mummy, The Invisible Man, The Wolf, The Creature from the Black Lagoon, and celestial sci-fi beings. The show is entirely movement based, featuring no spoken words, and accompanied by haunting, melancholic, and occasionally electric musical selections. An expansive screen on stage projects background scenes from horror films, elevating the terror factor of the set. All four dancers delivered strong, fierce and focused performances, though I was especially taken by the movements of Carlene Brick. She was dark magic on stage, gliding and thrashing with purpose and intent. The choreography was well thought out, and the dancers interacted with a beautiful familiarity. In one piece, the dancers were cloaked in flowing, seemingly-illuminating floor length dressing gowns. They made graceful, spirited, breathy movements, and I felt as though I was watching a wicked seance unfold. The dancers were like fiery candles, burning bright and then extinguishing on the floor of the stage as the theatre lights cut to black. In another piece, as wild werewolves, the dancers crawled and contorted on stage, unfolding their limbs into the air, as though they were rising from their dark depths to the summoning full moon. Universal Horrors pays homage to some of the most iconic horror film monsters and does the undead justice. 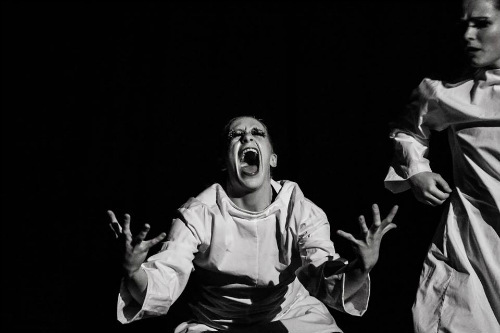 It’s a captivating, fully fleshed out dance performance, and is recommended for those who love strong movements and things that go bump in the night.